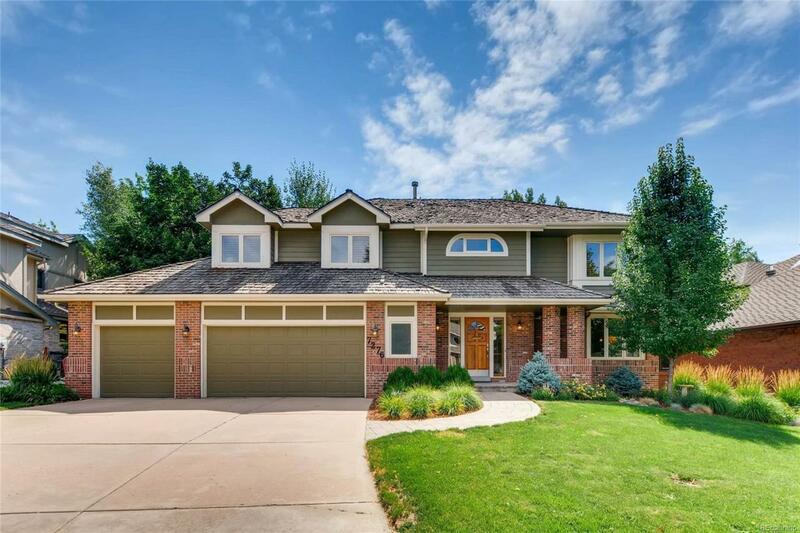 Beautifully updated 2-story in Sundown Ridge featuring 4 beds and 3 baths. Stunning 2-story entry with curved staircase welcomes you into the spacious main level with formal living and dining room. Wood floors flow through the updated kitchen, eating space and 2-story family room. New Andersen sliding glass door gives access to stone patio and large fenced back yard with mature landscaping and dog run. Large master bedroom features plantation shutters, ceiling fan and updated 5-piece bath with jetted tub and walk-in closet. The additional 3 bedrooms each feature ceiling fans and plantation shutters, plus updated full bath with tile floors and granite counter tops. Unfinished basement has 9 ceilings + 2 egress windows. New roof in September! Blocks to light rail and Downtown Littleton. A fabulous opportunity to live within the Littleton Public School District which has received the States highest academic accreditation rating of "Accredited with Distinction 7 years in a row!